Winter here in North Texas seems to have arrived overnight. Up until last weekend our weather had been pretty mild and fall like. But Tuesday night we received a strong cold front dropping the temperature drastically. We always get so excited for fall weather, but it seems like we go straight from summer into winter in a blink of an eye. All I can say is that's how we roll here in Texas. As the weather starts to cool down, it's time to put up the barbecue grill and pull out all of our favorite soups, stew and chili recipes. To kick off winter and chili season, I decided to try my hand at a new chili recipe. 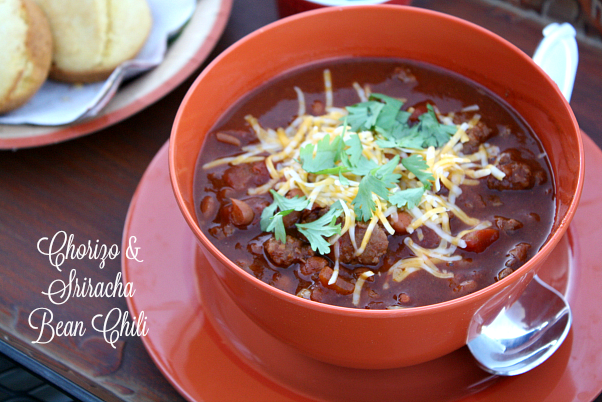 Chorizo & Sriracha Bean Chili to be exact! I'll be honest Sriracha sauce and anything with Sriracha really isn't for me. I love spicy food, but I just don't care for the bite that comes along with Sriracha sauce. I was a little hesitant about adding Bush's® New Sriracha Beans into my chili, but I was pleasantly surprised at the end result. 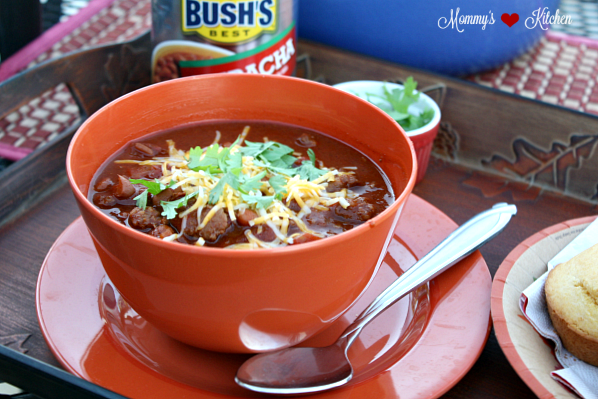 In fact, I was shocked at just how much my family and I loved this new chili recipe! 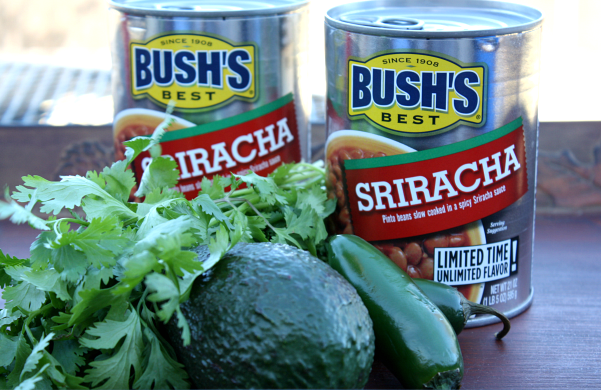 Bush's® Sriracha Beans are pinto beans cooked in a spicy and tangy garlicky Sriracha sauce. Besides chili these new beans are also great as a side dish served with beef, chicken or pork. 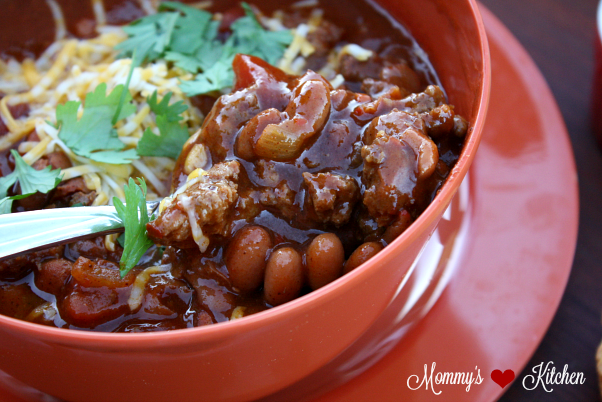 I used a combination of Chorizo sausage and ground beef in this recipe. The chorizo along with Sriracha beans gave this chili a bit of kick, but it wasn't overpowering at all. 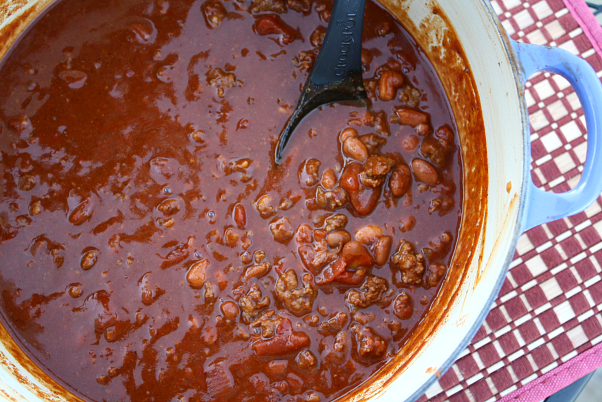 I made this chili on the stove top in just under 45 minutes, but this recipe can easily be adapted for your slow cooker. 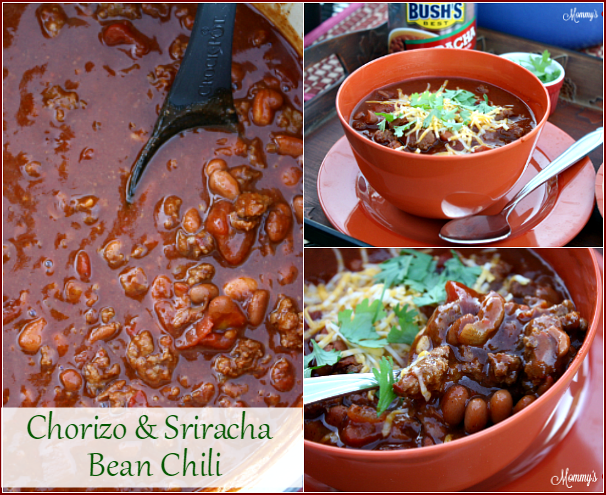 As the cold weather sets in I hope you'll give this new Chorizo and Sriracha Bean Chili recipe a try. Let's get started on this easy recipe. To start, heat the olive oil in a dutch over medium-high heat. Add the onions and garlic and saute until tender and soft. Add the chorizo sausage and ground beef and cook until browned (breaking the meat up as it cooks). Drain off any grease. Add the beef broth, tomatoes, tomato sauce, chili seasoning packet and beans. Mix to combine. Bring the mixture to a boil, reduce heat to low, cover and simmer for 30 - 40 minutes. Ladle into bowls and serve with shredded cheese, fresh cilantro, lime juice and avocado slices. Heat the olive oil in a dutch oven over medium heat. Add the onions and garlic and saute until tender and soft. Add the chorizo sausage and ground beef and cook until browned (breaking the meat up as it cooks). Drain off any grease. Add the beef broth, tomatoes, tomato sauce, chili seasoning packet and beans. Mix to combine. Bring the mixture to a boil, reduce heat, cover and simmer for 30 - 40 minutes. Ladle into bowls and serve with cheese, cilantro, lime juice and avocado slices. Bush's® Sriracha Beans are only available in stores for a limited time, so make sure to pick a few cans on your next grocery trip. This is a sponsored post written by me on behalf of Bush's Beans. I've received samples and compensation for my time and efforts in creating this post. All opinions are my own. This is so good!!! I made it tonight and everyone loved it. The spice is just right, and the flavor is so unique and delicious. Perfect for the cold night we're having here!